Now here’s the only salad that I think you will ever need. From the Veggiestan cookbook, this was going to be a side for another dish but I decided it wouldn’t go so we had it as a meal on its own. I can’t praise this enough and can’t to wait to make it again this weekend. Simple to make. Great combinations of flavour and textures. And it looks great too. No two Waldorfs are ever the same, although they do typically have lashings of mayonnaise. This one doesn’t and substitutes it for yoghurt, which is obviously far better for you. The Veggiestan Waldorf is very simple. 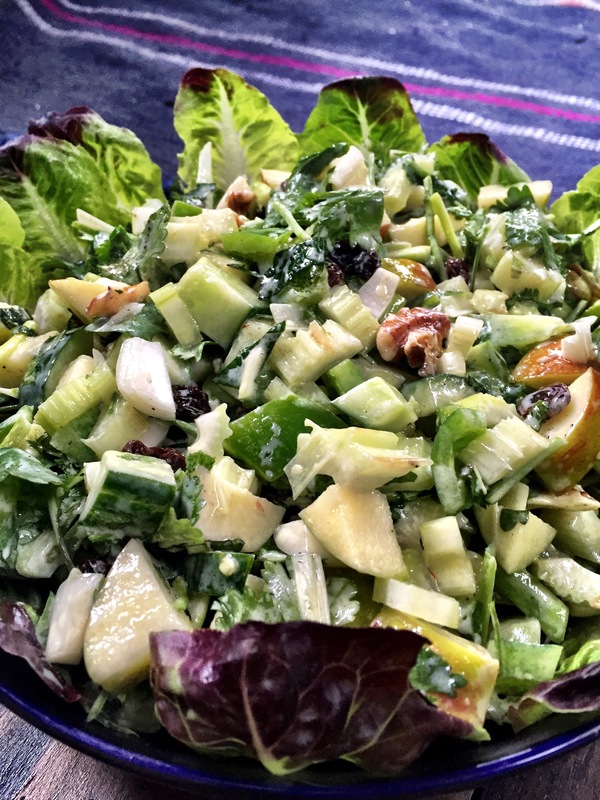 Line a bowl with some nice crisp gem lettuce leaves, and then in a bowl combine chopped apple, celery, onion, cucumber, green pepper, walnuts with raisins, coriander and mint. To this mixture you add your dressing of yoghurt, apple cider vinegar, honey and some infused saffron. Finally tip your mixture between all the salad leaves. This is quite amazing. I could eat this all day every day – and I think it would go with absolutely anything; BBQs, meat, fish, it’s a really good salad. Quite frankly you could just have it on its own. Its very satisfying. We don’t often do pasta. Too many carbs! But for some reason I felt Freya needed a lasagne to cheer her up a bit. The Brits tend to make their own version of lasagne and I imagine it is a million miles away from anything the Italians make. On Australian Masterchef this year one guy made a lasagne the English way (adding cheese to a white sauce) and he was suitably chastised by Marco Pierre White for not making a proper bechamel and using th wrong type of cheese – oh and doing the layers in the wrong order. 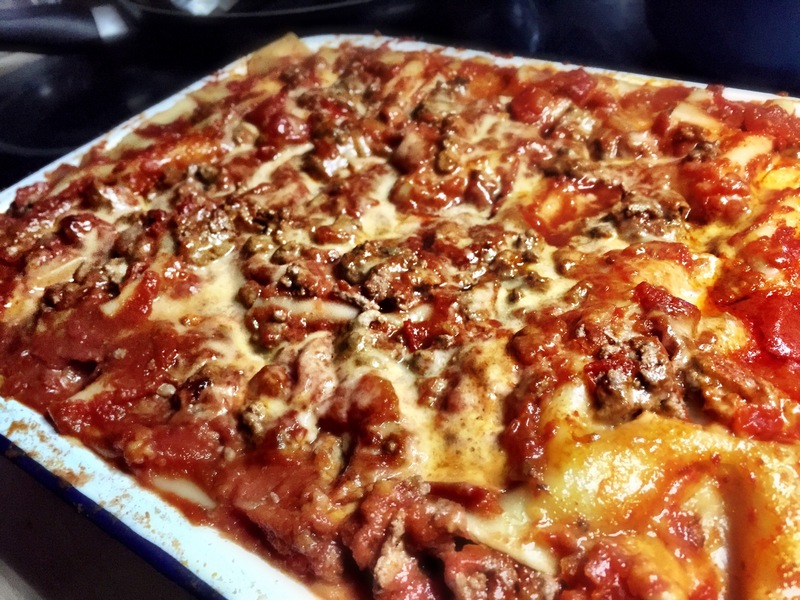 I tend to make my lasagne different to most as well so I thought I should try an Italian version. Now granted you can’t normally trust Nigella to do anything authentic but this lasagne did remind me of one I’d had in Italy many years ago. This lasagne has no white sauce. It doesn’t even have buckets of minced meat. Oddly, it contains slices of cooked ham and hard boiled eggs. Sounds strange – but it was amazing. You can make this (well up to the point it goes in the oven) in less than 20 minutes. It is very easy. Most of the stuff from the Nigellissima book can be achieved by anyone – even if you do lack the rich language and voluptuous figure that comes hand in hand with her recipes. 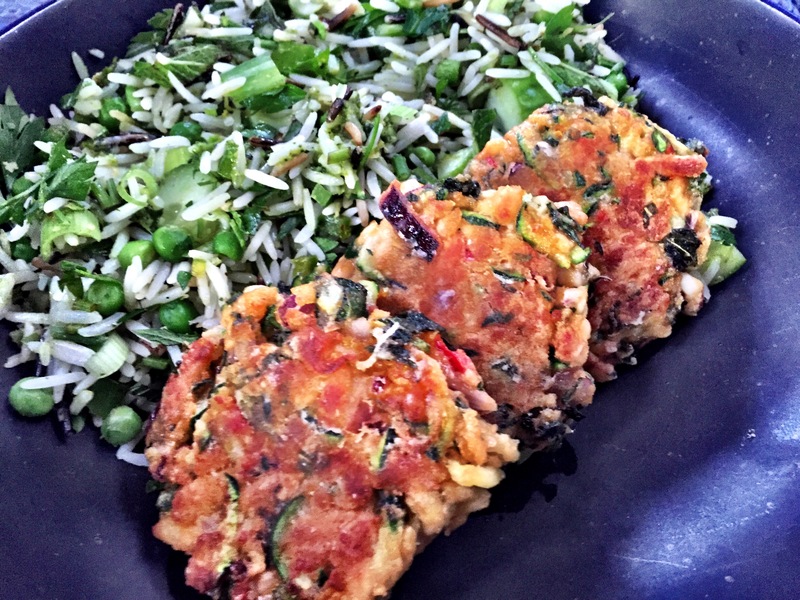 It is hard to believe it is one of her recipes because it is broadly quite healthy. Compared to the desserts in the book – which are guaranteed to give you heart failure! That said, she does say it is great for soaking up alcohol; so it clearly has a purpose! Anyway, how do you make it!? Well first you hard boil some eggs. You’ll need these to be peeled and cold so do those first. While they are on the go you make a very runny tomato and meat sauce by frying some onions, adding some mince, adding red wine, then a lot of passata and the same again of water. I had to shift my sauce to the pressure cooker as my pan wasn’t big enough to hold 2.5 litres of sauce! While the sauce is on a rolling simmer for 10 minutes or so you can peel your eggs! Then you simply ladle the sauce into the bottom of your dish, add dried lasagne sheets, add another layer of sauce, then add slices of cooked ham (that stuff you put in your kids sandwiches!) and some sliced/chopped hard boiled egg. Build up the layers until you’ve filled your dish (I did 4 layers) and top with one last layer of sauce and a load of grated parmesan. Cover it in tin foil (I had a panic! I thought I didn’t have any) and wrap it tight and pop it in an oven for an hour. And it’ll be done. Something awesome happens while it’s in the oven. The pasta layers all ripple and all the sauce soaks into the pasta leaving it so beautifully cooked. Being under foil effectively steams it too so you won’t get any hard uncooked bits. British lasagnes are all flat and regimented and predictable but this one is quite amazing. You don’t even miss the white sauce. And it isn’t a meat overload. The dots of mince here and there are all you need – it’s pretty special! If you’re feeling cheated on the cheese you can always use more or try a stronger cheese but I found it perfect just the way it was. And was the ham and eggs odd? No. They were a great addition indeed. Nice dish. I’ll definitely make it again. And we’ll definitely be eating it again today as we barely dented the batch that I did make! Last night we were supposed to meet up with an old work colleague but it didn’t work out. Just as well really given the expensive meal we had out on Monday at Hawksmoor Bar in Seven Dials. This comforting and very filling dish comes from Mildred’s. This is the second thing I’ve cooked from their book. 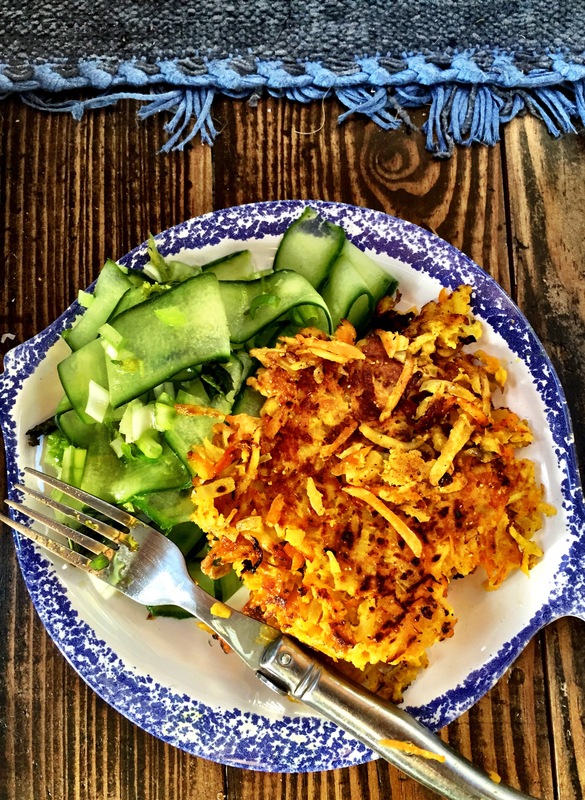 We’d already had Latkes the day before – and these are similar in concept – but I really fancied them so I chose to ignore the fact that I was frying stuff off in a pan; a few extra calories and grams of fat won’t hurt once in a while. We’d have done far worse if we’d have eaten out. One of the dangers of frying at the moment is Freya has just reupholstered our sofa on the boat with a beautiful Laura Ashley fabric. It’s quite amazing what she’s managed to achieve for a first attempt. The cushion covers are perfect; complete with contrast piping. BUT: The sofa does back on to the island unit of the kitchen. So the hob is directly above it – and any splashes from a frying pan are heading straight for the sofa. We already have a plan to add a sort of splash back to the work surface to prevent such things but for now I just have to be extra careful. The beautiful sofa is covered in old throws – hiding all the great work – sad times! Anyway. These fritters are pretty easy to make. You grate a slab of haloumi into a bowl, add chopped red onion, chilli, garlic, mint and lemon rind and mix together. You then add grated courgette (with all the water squeezed out of it), eggs and fresh breadcrumbs and form a blob of mixture. Once you’ve let it rest a while you form egg sized balls (rolling them in flour) and fry them in a pan; pressing them down as you fry them to make them more patty like! I found this to be quite messy – the mixture was quite sticky – I probably could have squeezed more liquid from the courgettes – but I was being impatient. We had 4 each together with the salad – which was pretty yummy too. The salad is made from Wild Rice (which I couldn’t get so I used a Basmati and Wild Rice Mix), which you cook and allow to go cold, spring onions, cucumber, mint, coriander, parsley, green chillies, lemon juice and rind and frozen peas that you’ve allowed to thaw. Mix it all together its nearly done! I didn’t thaw the peas. I chucked them in with the rice while it was cooling, much quicker! The rice has ‘Green Harissa’ stirred through it and this takes some time to make. Once you’ve made it though you have tonnes of the stuff for future recipes as you can keep it in a jelly jar and store it in the fridge – I don’t see why it wouldn’t keep. The Green Harissa is made by roasting a handful of green peppers in a very hot over until they pop, skinning and deseeding them and blending them together with cumin and fennel seeds, sumac, chilli fakes, coriander, mint, parsley, lemon juice and rind, spring onions, peas and garlic – oh and a lot of olive oil. You need to blend the harissa until it is really smooth. I used my Nutribullet but it really struggled with the quantity I was blending. I tasted it and it was very runny and bitter and then I realised I’d forgotten to add the peas (I only noticed as I’d left them on the side and they were the only spare ingredient left out). After these were added it was much thicker and tasted much better! Most of the Harissa went into a jar. You only need about 100mls for the Salad – I had over half a litre left over! This dish took a while to make. Fortunately we’d had a snack of stuffed vine leaves from our local Syrian supermarket in Brentford ‘Al Shaaam’. They always have everything I need for the type of cooking I enjoy and they are far cheaper than Morrisons. The staff there are so friendly and helpful – even more so now that Ramadam is over! I really recommend this dish. If you make it to the recipe you’ll have enough for 2 meals easily. It makes a lot more than you think – and as tempting as it is to go back for seconds there is that waistline to look after! I haven’t cooked anything new for a while. We’ve been running down our fridge as we spent several days at Freya’s and my Mums and didn’t want anything to go bad. Freya has been reupholstering our sofa and it needs lots of space – one thing we don’t have on the boat. 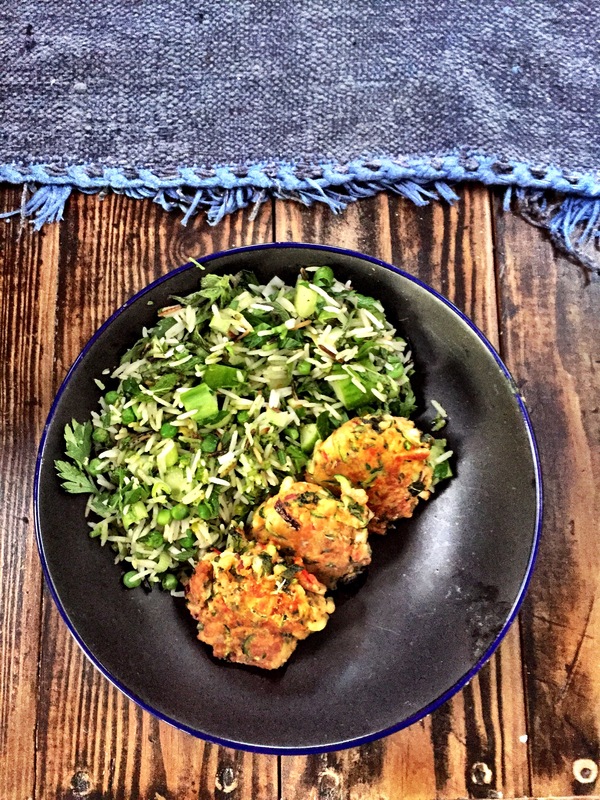 These Latkes are from a new book I have called Mildred’s. Mildred’s is a vegetarian restaurant in Soho and this book has some pretty amazing recipes. This is the first thing I’ve made from the book so it’s too early for me to give it the big thumbs up – but I have a shortlist of many dishes so watch this space. I picked this out as it seemed light and was just the ticket for a hot summery day. It’s pretty simple. Grate carrots, parsnips and apple into a bowl. Add coriander, cumin, chilli powder, fresh ginger, polenta, flour and egg and combine. Then just fry the latkes in batches. I did struggle a bit with these. They weren’t keen on staying together at the beginning and I had mixed results throughout the cook. The salad was simply a cucumber cut into ribbons with one of those wide vegetable peelers and then mixed with chopped green chilli, lime zest, lime juice and spring onions. The combination of the two was quite excellent. The cucumber neutralises the kick of the ginger and the chilli powder. Certainly one to make again. I was planning on making some courgette and haloumi fritters after I’d made these but they were more than filling enough. The planned BBQ at Freya’s parents on Sunday almost became a wet one. It was windy and rainy all day, in complete contrast to the previous day – which was sunny and hot and made our Monopoly Board Pub Crawl a very pleasant day indeed. 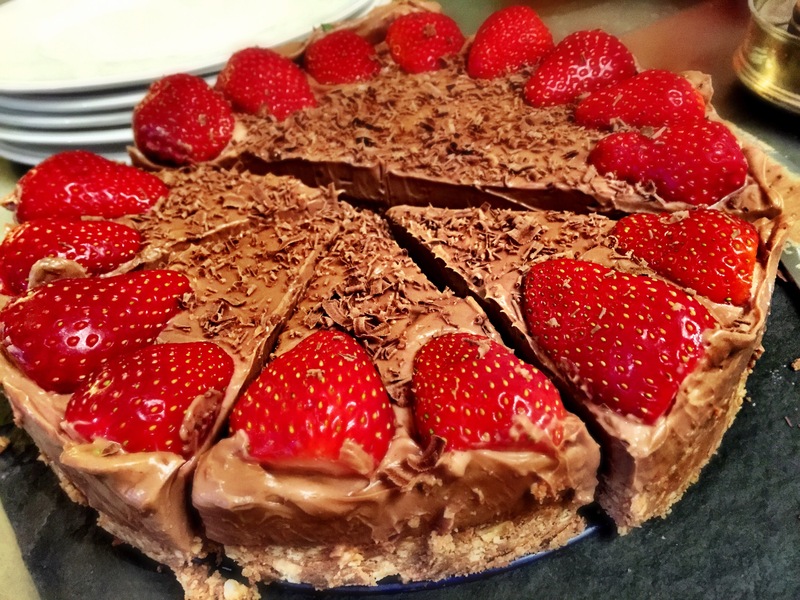 Aside from all the BBQ’d food – which was delicious – I knocked up this cheesecake in response to Freya’s mums request. It wasn’t quite the desconstructed cheesecake she wanted but it was quick and easy – and time wasn’t on my side on Sunday. The recipe comes from Nigelissima by Nigella Lawson, so as you can imagine it isn’t particularly low in fat, or low in anything for that matter. It was made in less that 10 minutes. You just needed to firm it up in the fridge for a while. Simply blitz some digestive biscuits with some hazelnuts, butter and a scoop of Nutella until you get a soggy biscuity mess. Press this into a spring loaded cake tin. Then whip the rest of the jar of Nutella with some icing sugar and some cream cheese until smooth. Spread this over the biscuits. Finally top with some crushed hazelnuts. I did it all in Freya’s mums Thermomix in seconds. Must get one of those! Clearly I didn’t do this last step. I forgot to keep some nuts to one side so I ended up adding strawberries as a topping instead. Looks just as good I think. This is delicious. Everyone’s eyes lit up at the prospect of a Nutella anything and it tasted as good as it looked.